This is an important election year for Kentuckians. All of Kentucky's constitution offices are up for vote this year, including our Governor, Attorney General, Secretary of State, Auditor, Commissioner of Agriculture, and Treasurer. We believe our votes are key and can make a difference in the elections and issues we care about. We are dedicated to developing a democracy where everyone – regardless of income, race, sexuality, political position or gender– has an equal voice. Where leaders listen and respond to community needs. 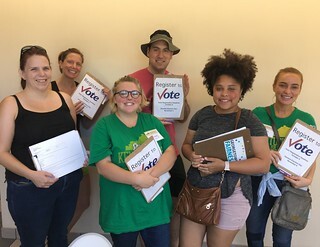 This voter guide site is just one of many outreach tools Kentuckians For The Commonwealth uses to further develop active and informed participation in our elections in an effort to build a Healthy Democracy in Kentucky, one where ordinary Kentuckians have a say in decisions affecting our lives. Working together, we can build the Kentucky we envision. Right now we have an opportunity to grow a healthy democracy – starting with making informed choices when we go to the polls. Polls are open from 6 a.m. to 6 p.m.